We did manage to get further south a couple of times, down to Black Point and Little Bay beyond. In Little Bay, we have friends ashore, Doug & Jean in a castle named, appropriately, Sandcastle and Frank & Peg in a pink house called O’Brien’s Landing. Peg had gone to the US for a few days and her purse was stolen, containing her passport, credit cards etc. Thus she was still in the US and we didn’t have a chance to meet up with her. But, Doug & Jean hosted a potluck one evening and a great time was had by all. Of course, the wind doesn’t allow us to remain at Black Point very long. A day or so, here and there is all we can usually get. Just long enough to do laundry at Ida’s Rockside Laundry, the prettiest laundry in the Bahamas! And the cleanest! It is expensive but so much easier than doing laundry in a bucket. Sheets and towels are almost impossible to wash in a bucket. Our friends on Merlin have headed north as they need to be at their son’s graduation by mid March. We were sorry to see them leave but have acquired another newbie already. Resolve, with Mike and Debbie aboard, are following us from place to place and have no agenda. Debbie was very nervous snorkelling but, after some time spent together on a shallow beach, we were able to show her some of the beautiful underwater scenery. The game plan, once this current period of wind calms slightly, is to head north to Spanish Wells. There we will show Mike and Debbie the sights and introduce them to friends ashore. When the weather allows, we will make our way north into the Abacos, hopefully before mid March. And then, ultimately, to the US near the first of April. So, the bow is turning north once again as this, our eighteenth winter aboard, is winding down. But, there is no time to be sad as the locals are having a cookout ashore today, with crafts and goodies to sell. Grab some shoes and a hat and jump into the dinghy as the party awaits! That too is life aboard. As the weather guru has been telling us every morning, what a strange winter this is ! The cold fronts have been coming through every 48 hours for the last month, making travel between the islands difficult. But, we have managed to get all the way down to Staniel Cay, Exuma. In the Berry Islands, the wind only allowed us to get off the boat once and we made the annual trek to the blue hole. After that, it was boat jobs and reading as the winds howled through the rigging. Murray had a lot of fun, fishing from the cockpit. He attracted a barracuda, who lurked under our hull, and had to share about half of each fish he caught as the barracuda took his big chunk out of the tail. 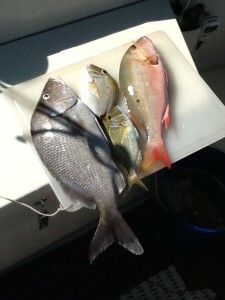 On Feb 3rd, the wind abated enough to allow us to head down to Nassau. It was a fast trip on a beam reach with all fishing lines deployed. About six miles from Nassau, one of the lines went zzzing! Murray rushed over and applied the brake. Then the second line sounded off as well. He hurried to to the second line while I struggled to bring in the first one. The fish on my line was so strong that I was afraid to remove the pole from the holder as I might just lose fish, pole and all. So, we both cranked away and watched as the Mahi-Mahi’s got closer and closer. Mine leapt into the air several times trying to spit the hook. Murray got his close to the boat and prepared to haul it into the cockpit. Just then the line broke. Oh no! Murray dashed over to haul mine in. It was the male or bull and quite large. 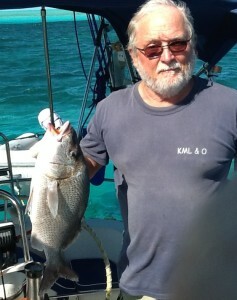 Just as the fish reached the stern of the boat, he took another big leap and spit the hook! Two lovely fish and they declined our dinner invitation! In Nassau, we re-stocked and finally did some laundry. It had been about three weeks since laundry facilities with just a bucket laundry in high winds to keep us going. But, we didn’t stay there long and took a light wind opportunity to motor across the banks to Normans Cay. We arrived at Normans about 4 pm and tried to anchor in the basin. The current and our forward momentum managed to wrap the chain around the anchor shank as it was deployed. But we didn’t find that out until the anchor didn’t set. Murray hauled it up again and finally managed to free the chain. Meanwhile I was making circles, watching the approach of a huge black cloud. Finally the anchor was down and set and we dashed below just as the squall hit us with torrential rain and strong wind gusts. The cold front came in during the night with the expected high NW winds. After spending one day boat-bound, we decided to use the 20-22 knot northerly breeze to sail on down the thirty miles to Staniel Cay, before the next front. With just a double reefed main and full jib on a close reach, we zoomed to Staniel Cay in 4.5 hours, anchor to anchor. It was a very fast trip and Merlin had trouble keeping up at times. But both boats anchored safely at Big Majors and enjoyed the balance of the day. In the morning, we moved into protected waters for the next front and led Merlin to a safe anchorage near town. Merlin has a very small dinghy and motor and, in order for them to enjoy the islands, they need to have a short travel distance. Once they were hooked well, we loaded the crew, Robert and Catherine, into our dinghy and took them ashore in Staniel Cay. After exploring, a visit to the clinic to donate some medical supplies and a stop at Batelco to solve my internet connection issues, it was time for a lovely lunch at the Yacht Club and then back to the boat to prepare for the next big blow. That blow was due to arrive during the wee hours of the next morning and it blew in with a bang. Winds were 30-35 with gusts to 50. And then the radio came alive. A boat was in trouble down by Big Farmers Cay. It had dragged and was on the beach. A vessel was sent out from Little Farmer Cay to assist but determined that it was too dangerous to do much in the dark but take the crew off the grounded yacht. When daylight came, we were secure in our anchorage but boat bound, reading and listening to music. About 2 pm, I heard a radio call “Pan pan, pan pan, pan pan”. After listening for a few minutes and hearing no other response, I responded. It was the crew from the grounded vessel, looking for a pump to take the water out of their holed yacht. I contacted a local salvage vessel and relayed the information. Once they contacted the crew by telephone, my job was done. Just another day in the islands. Today the wind is down slightly but it will return again tonight, with another cold front. Tomorrow’s light winds should allow us to visit town for fresh fruits and vegetables. Perhaps on Saturday we can sail south to Little Bay, near Black Point, for a change of scenery and to visit with friends. If the winds permit. PS The new engine now has 40 hours on it and will get its first oil change in the next few weeks. We have two concerns: noise and vibration. Neither of these things will likely change as the Yanmar shakes and a vee drive requires firm motor mounts – this increases our vibration. The three cylinder engine is louder than our old one and the noise is increased by the larger exhaust hose.